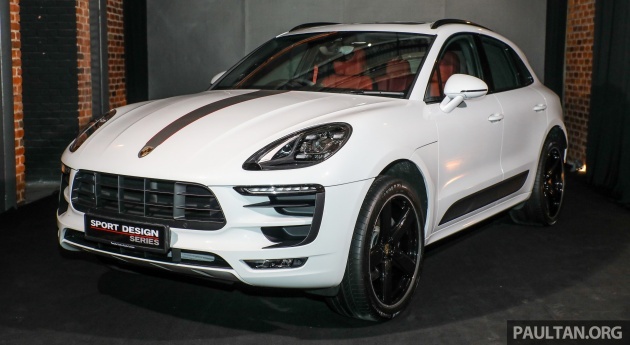 Porsche distributor Sime Darby Auto Performance has just unveiled the Porsche Macan SportDesign Series. Limited to just 40 units in Malaysia, the special edition model features a number of aesthetic tweaks and a higher level of standard specification. Priced at RM545,000 without insurance, registration, road tax or other on-the-road costs, the SportDesign is over RM100,000 more expensive than the standard Macan on which it’s based, but it does have plenty of options bundled in. Available in either Volcano Grey Metallic or Carrera White Metallic, it’s set apart with a red and silver bonnet stripe, along with red pinstriping on the rear spoiler and diffuser. The car also comes with a body-coloured front apron, side skirts and rear valance, plus black Porsche Dynamic Light System Plus (PDLS+) LED headlights, tinted LED tail lights and a gloss black finish on the roof rails and sports exhaust exits. Two wheel designs are available, both measuring 21 inches – the multi-spoke 911 Turbo wheel or the forged five-spoke Sport Classic wheel in black. Inside, the SportDesign features Black and Garnet Red leather upholstery, with red also adorning the contrast stitching, seat belts, instrument cluster dials, and Sport Chrono stopwatch. Also fitted are 14-way power-adjustable front seats with memory and a 14-speaker, 545-watt Bose surround sound system. Air suspension with Porsche Active Suspension Management (PASM) dampers also comes as standard. The mechanicals are unchanged, so the SportDesign soldiers on with the same 2.0 litre turbocharged four-cylinder engine producing 252 hp from 5,000 to 6,800 rpm and 370 Nm of torque between 1,600 and 4,500 rpm. As usual, there’s a seven-speed PDK dual-clutch transmission and all-wheel drive, allowing the Macan to sprint from zero to 100 km/h in 6.7 seconds before hitting a top speed of 229 km/h. Killer option list but then it’s the same case no matter which country you u are buying a Porsche from. Those are not the only problem. With the new generation of Cayenne and Panamera, this Macan’s dashboard amd interior is obviously looks dated! Langkawi no german taxes or G(erman)ST.